For many years now I've said the only 2 sports achievements I needed to see in my lifetime were Kevin Harvick winning the Sprint Cup Championship and a Triple Crown. The first took 14 years, the second took 37 years, but amazingly I got to witness both within the span of 6 short months. 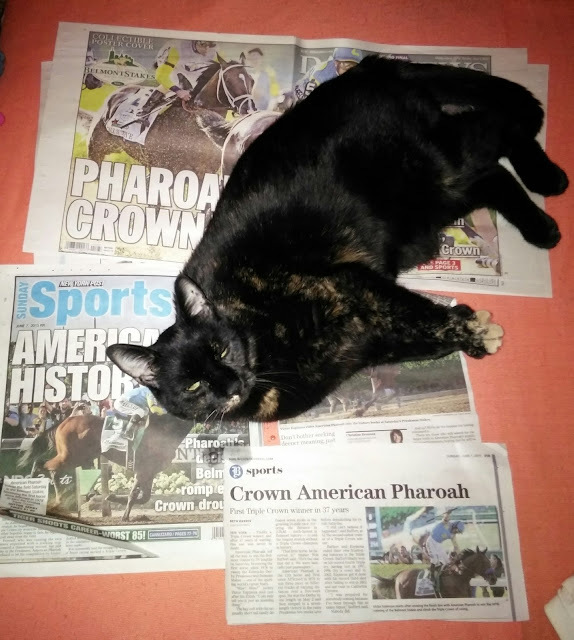 I collected Sunday's newspapers with articles on American Pharoah's Triple Crown win, and decided to gather them together on the bed with the hopes that Truffles would pose with them. She had other ideas...she instantly climbed on top of the papers and started rolling around on them. I guess my little girl is reveling in history just as much as I am! In case you missed it...I will *never* tire of watching this!!! We wuz so happy to see a Triple Crown winner! This made the second Triple Crown that I have witnessed and I screamed like crazy both times! It was so exciting! A Triple Crown winner is an amazing feat! We can see that Truffles appreciates and wants to be part of these events! This is very exciting! My grandmother always watched and would speak of the previous triple crown winners fondly. She passed away this year and I have to think she would have so enjoyed it! 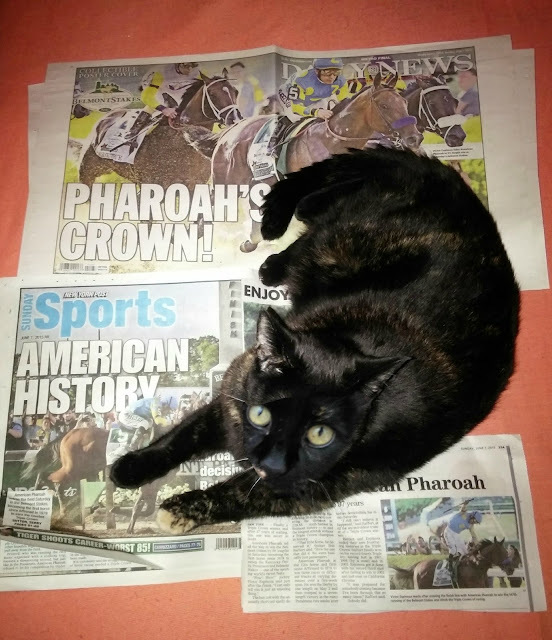 My cats can't turn down newspaper either! Enjoy the reading. What an accomplishment. Yay American Pharoah! Very exciting! Looks like Truffles is excited, too. Truffles is such a cutie! I am glad you got to see your 2 wins so close together. We never turn down the chance of rolling on the newspaper and especially if Mum is trying to read it! Truffles is so beautiful and knows how to pose! Love the pics, Truffles, and glad Mommy got two of her wishes. Well yous did want hers to pose wiff them, wight?. MOL Have a gweat day. Truffles, you look adorable rolling on the papers. Was that just not the coolest thing ever????? It was an amazing win! I remember Affirmed's win 37 years ago clearly-it was my 10th birthday. Talk about a great present! lol American Pharoah is amazing. I shared an apple with my off track thoroughbred in celebration! 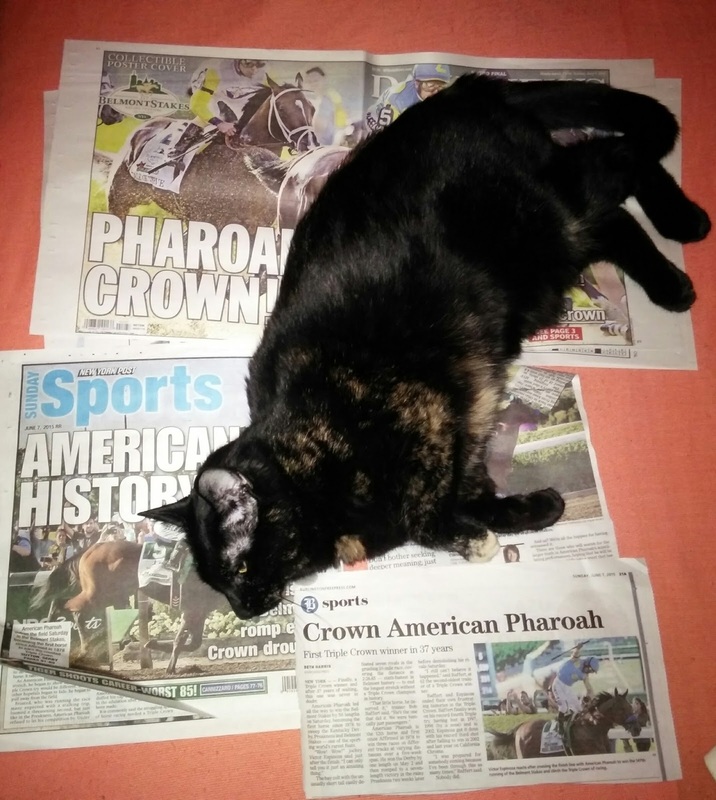 We were so thrilled with American Pharoah's win. It was pawsome!!! LOL! 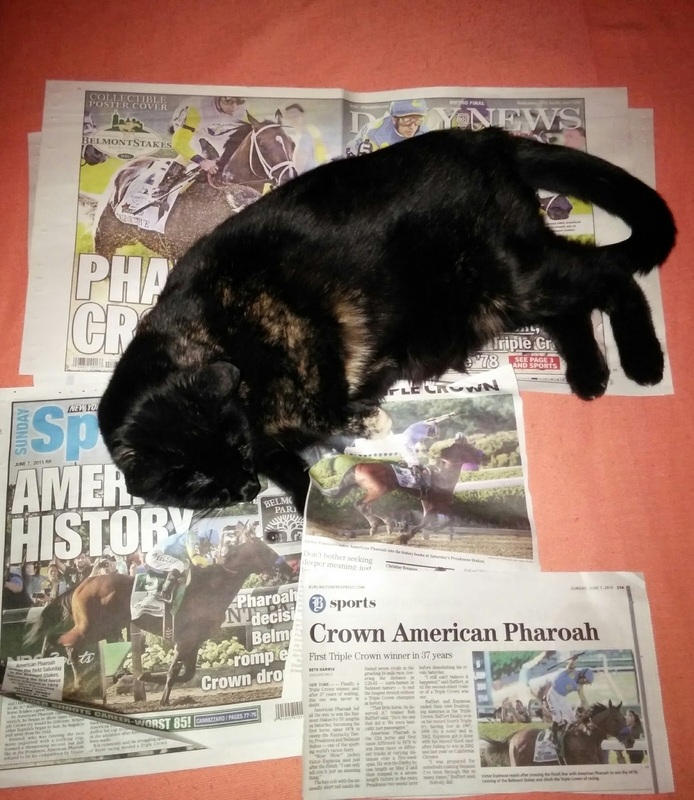 I think Truffles had the right idea, finally having a Triple Crown winner is worth reveling in! So adorable. She’s posing with them better than I would! Pop refused to watch cos he said horseracing is cruel to animals. It was a really good race! Truffles sure does look like she's happy about those wins! Haha! How fun! I'm glad that you got to see all of these wins happen. It sounds like Truffles is pretty excited about it too.